Two pieces of really, really great news, guys! Blaise discovered a green egg in the coop! 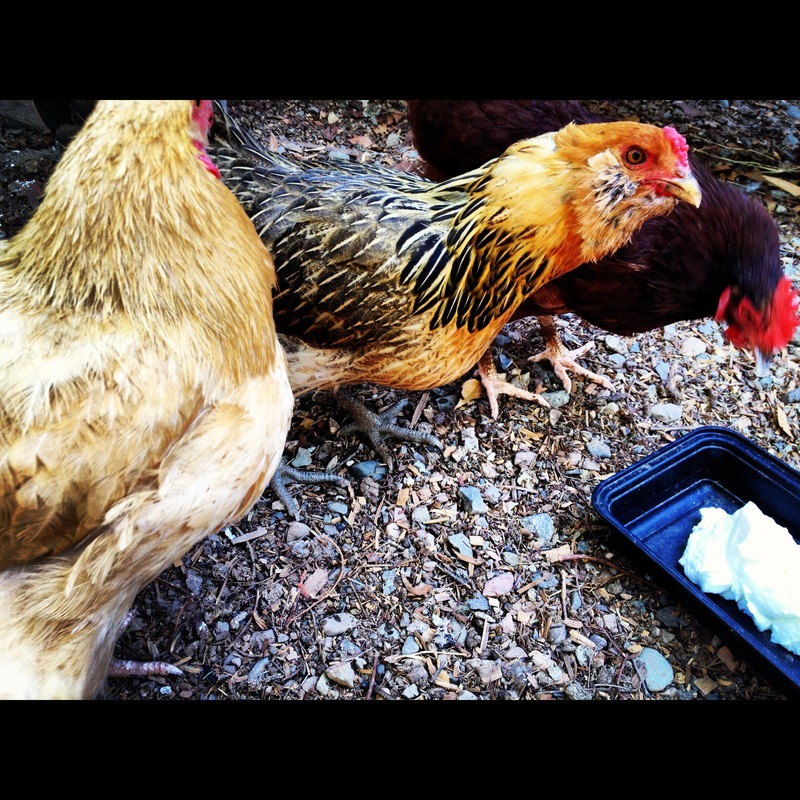 His newest chickens (which we still lovingly call “the babies”) have finally started laying! He discovered some white eggs a few days back, which was a little confusing because “the babies” are Ameraucana chickens, or Easter Eggers. Their eggs should be different colors, so the white was a tad disappointing. But hip hip hooray! A green egg! And more colors on the way, we hope! Only two babies have started laying, so there’s four more to go. The little guy in the center is our green egg culprit, which I had previously named Corbett. (For some reason, all the chickens seem to have boy names. I am attempting to fix this for future broods! They are hens for pete’s sake! 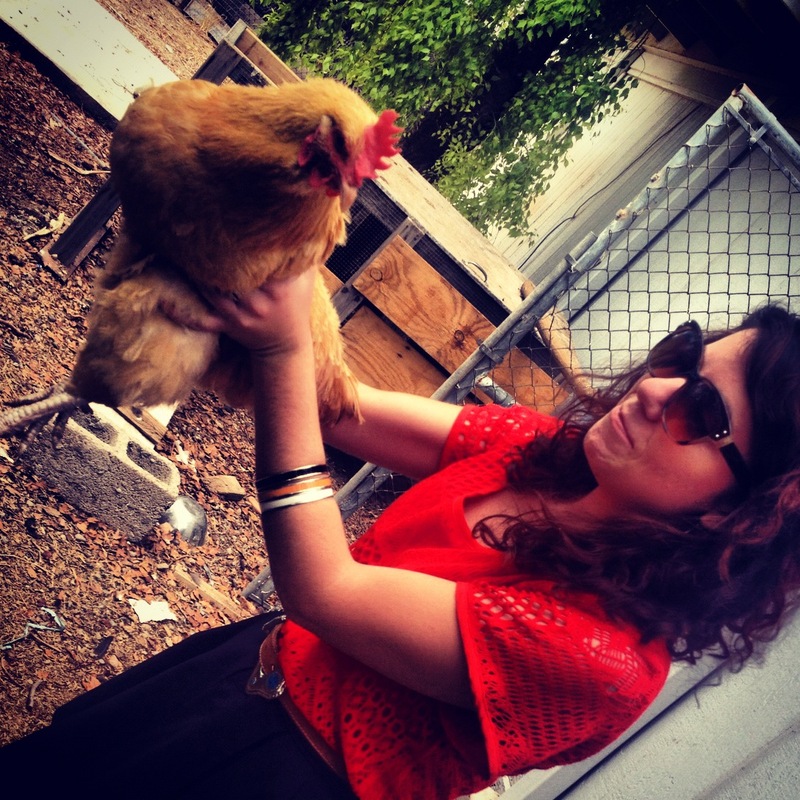 [oddly enough… one chicken is named Pete… oh boy.]). Side note: This is probably just me attempting to anthropomorphize the chickens, but I’ve noticed that the two babies who are now laying are able to compete with the older hens for food a bit better now. When the two broods were first integrated – the older and the younger – the babies got picked on a bit and were rather skittish. Now, Corbett and her laying buddy, Rusty, are front and center of the pack. The other four non-laying babies are still pretty much hanging out in the back and being afraid of everything and everyone. 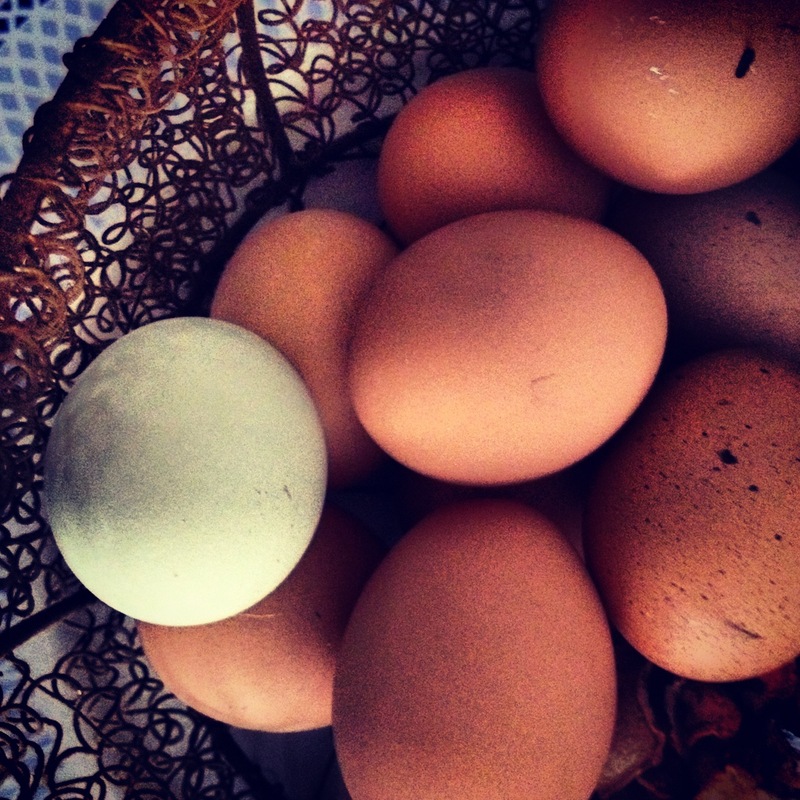 Does laying eggs give hens confidence? Have they achieved some kind of social standing in the brood? I wonder about these things. Does anyone have any info on this? 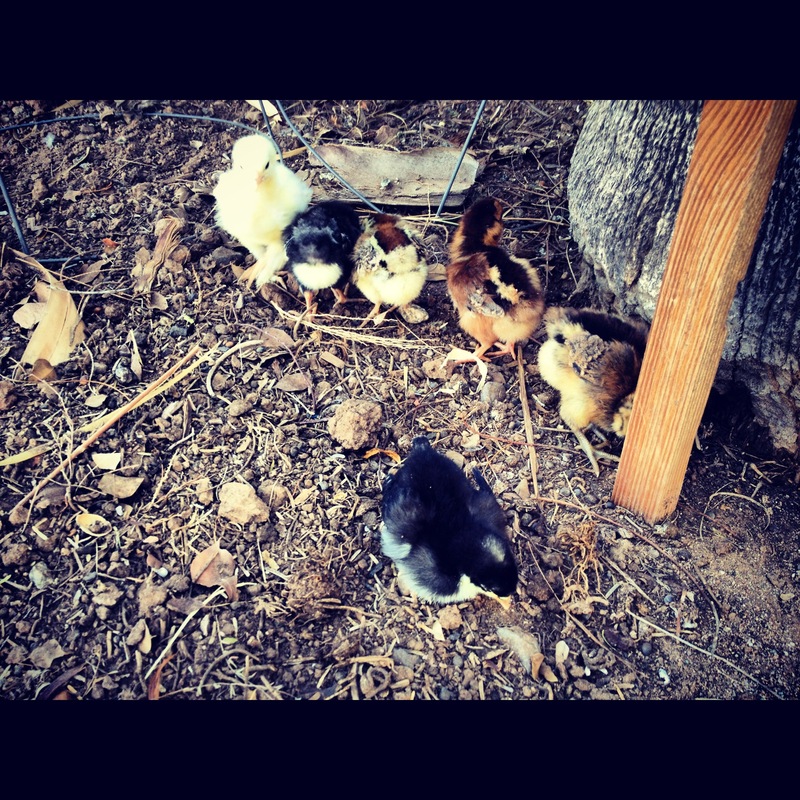 #2: We may or may not have decided to get more chickens! While I attempted to do physical labor (i.e. 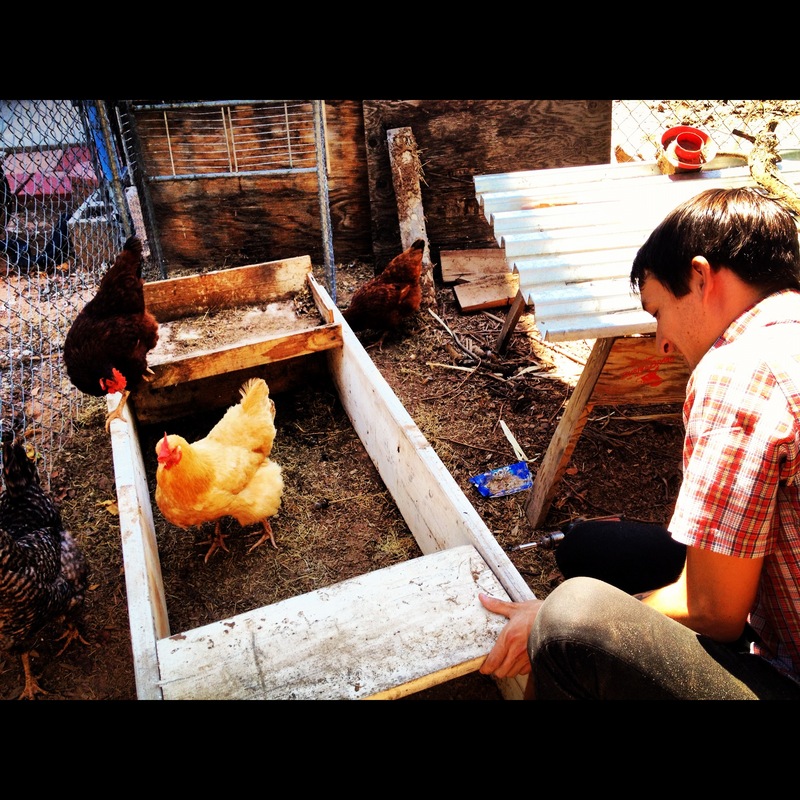 raking the garden beds or mopping inside, rather, to beat the heat), my very industrious boyfriend took to the little baby chicken coop outside. Since he has had several rounds of chickens already, he is old hat at the whole thing and has a pretty good setup. That doesn’t mean, however, that he doesn’t want to constantly improve on the process. He’s working on fitting in a “doggy door” for the chicks so it’s easier to get them in and out of the little cage. In the above, you can see Mabus, Pete, and Henface (yes, Henface. I was not around when she was named!) are clearly doing everything they can to distract Blaise from his power-tooling. Such a helpful little brood! 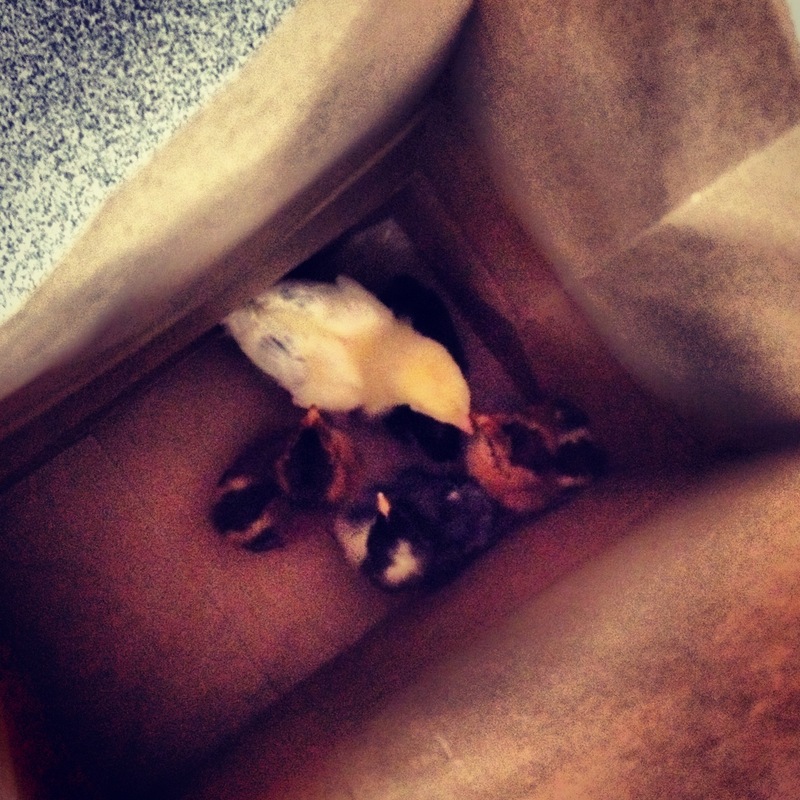 Then it was off to the store to pick out our little chickies! 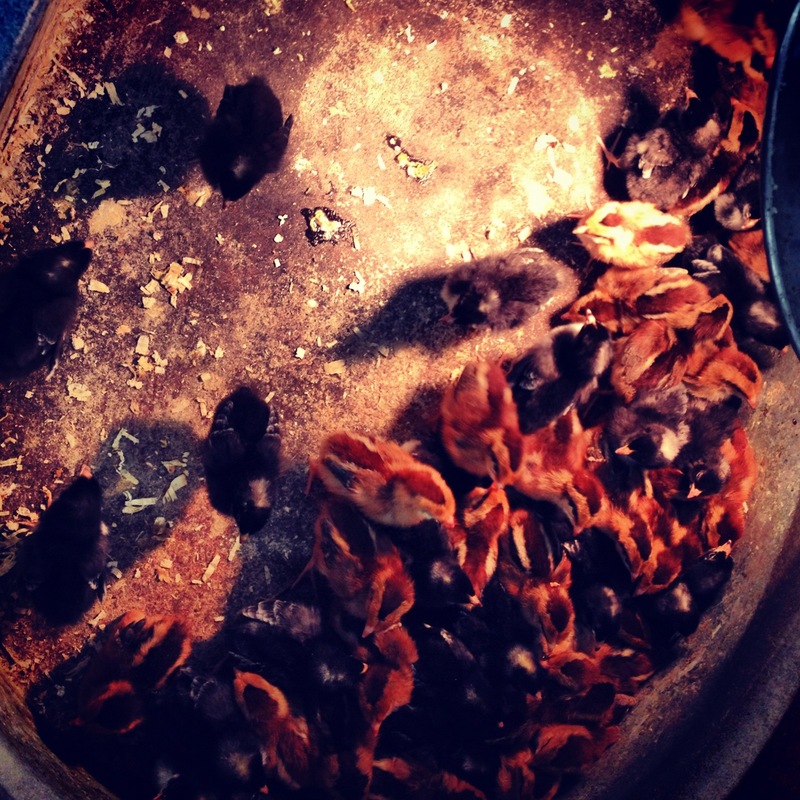 At Pratt’s, there are several large tubs full of chicks, ducklings, baby turkeys, etc. I had a SUPER hard time ignoring the ducklings, but we were on a mission. We wanted very healthy chicks, so we had to watch the multitudes swarm around the tub for a while. We pulled out a few who really stuck out – strong ones, curious ones, energetic ones. We ended up with two Ameraucanas, two Cuckoo Marans, one Brahma, and one Welsummer. Six in all. We put them in a baggy and took them to their new home! My first baby chickens! I am so very excited!! It’s warm enough right now that they could probably go outside to the baby coup right away. However, Blaise and I decided we wanted to keep them inside for a week just so they could get some growing done without the stress of the adults wandering near them. The setup is not so very difficult. Right now they are in a large round tub filled with hamster-type bedding. They have water and feed in constant supply and a heat lamp. I hadn’t thought of this, but apparently it’s very important that the chickens have room to get out of the head lamp’s glow, but they seem to really enjoy hanging out in the warmth. By this I mean they have space to move around to different climates. As for their feed, I got them a mix made specifically for young chicks – lots of fiber, grain, protein, and a little bit of calcium. You don’t want too much calcium at this age, so we will add more of that into their diet as they reach laying age. I believe this particular blend has sorghum, soybean, corn, meat/bone meal, sugar, and vitamins. They don’t have a ton of space in their indoor home so we let them out into the garden every now and then to scratch around and enjoy themselves. I prefer that these visits be supervised, personally, because I have seen some cats sniffing around lately. And of course, once real plants have been put in the garden, they shall have to find a new playground! As I write this, I can hear their little peeps from across the room. It is the cutest little sound! They are pretty friendly and will sit in your hand for a good amount of time. I want to give them nice, girly names at some point, but I will probably hold off for now. No more Petes, Henfaces, and Mabuses! Only one is named so far, a little Americauna I call Goldie. The other ones will have to wait. But not too long, I’m sure – I am certainly one proud mama hen.